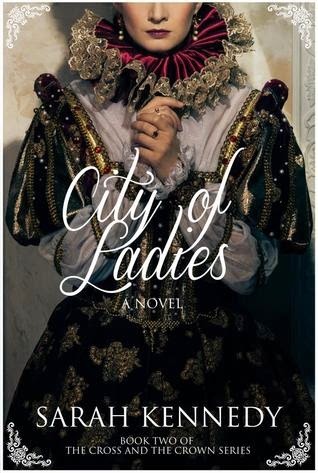 CELTICLADY'S REVIEWS: City of Ladies by Sarah Kennedy Spotlight with Giveaway!! City of Ladies by Sarah Kennedy Spotlight with Giveaway!! It’s midwinter in 1539, and former nun, Catherine Havens Overton, has just given birth to her second child, a daughter. The convent in which she was raised is now part of her husband's lands, lands that once belonged to Catherine's family. With a son, Robert, and her new daughter, Veronica, her life as the mistress of a great household should be complete. But Henry VIII’s England has not been kind to many of the evicted members of religious houses. And in order to protect her old companions from the hostilities, Catherine has gathered about her a group of former nuns in hopes of providing them a chance to serve in the village of Havenston, her City of Ladies. Catherine’s past haunts her. Her husband begins to suspect that Robert is not his child. Then the women of Overton House begin to disappear and one of them is found brutally murdered nearby. Seizing the moment, under the pretense of ensuring her safety, William forces Catherine to enter service at Hatfield House where the young Elizabeth Tudor lives. Sarah Kennedy holds a Ph.D. in Renaissance Literature from Purdue University and an MFA in Creative Writing from Vermont College. The author of seven books of poems as well as The Altarpiece, book one in The Cross and the Crown series, she has received individual artist grants from the National Endowment for the Arts and the Virginia Commission for the Arts, as well as an award for scholarship from the National Endowment for the Humanities. She teaches at Mary Baldwin College in Virginia. Her website is http://sarahkennedybooks.wordpress.com/. Offering one(1) copy of the book for giveaway. US/Canada only. Please leave a comment letting me know, what is your favorite era in history or your favorite historical fiction novel if you have one. Giveaway starts November 11th - December 2nd. I love reading of most historical times and settings, as long as a novel is engaging and convincing. Don't know if I could choose one favorite but Outlander and The Pillars of the Earth are certainly among my top choices. Thanks for the giveaway. Thank you for stopping by Nancy! Tis hard to choose just one era that I like most. I have read several books on the Tudors and the most recent was Sisters of Treason by Elizabeth Fremantle - and it was about Lady Jane Grey's sisters who had to live much of their lives at court under the suspicious eye of Queen Elizabeth. It was an excellent book. I also enjoy ancient Greek historical fiction. A winner has been chosen and it is Carl Scott!! Congrats and enjoy!